CHICAGO — Nearly three-quarters of respondents to this month’s American Drycleaner Your Views survey believe their dry cleaner’s sales volume will end the year as high or higher than their 2014 total, results show. 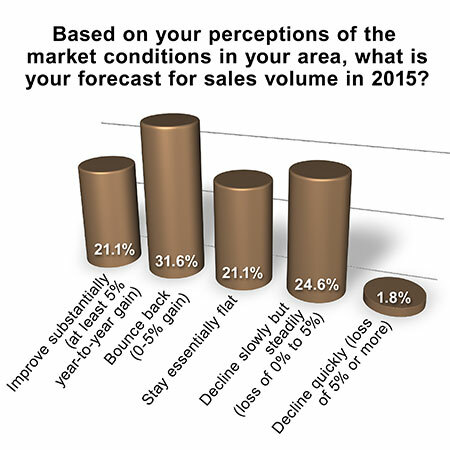 Among those who believe this year’s sales volume will have declined when compared to 2014 numbers, 24.6% peg a slow but steady decline at between 0% and 5%; just 1.8% say they’re expecting a sales-volume decline of 5% or more. While American Drycleaner’s Your Views survey presents a snapshot of the trade audience’s viewpoints, it should not be considered scientific. Subscribers to American Drycleaner e-mails are invited each month to participate in a brief industry survey they can complete anonymously. Due to rounding, percentages may not add up to 100%.